These days, most major architecture and engineering firms are using Building Information Modelling (BIM) on their projects. Global adoption of the BIM process is quickly growing, having an impact on every architect, engineer, and project stakeholder involved in delivering projects. Inherent in that process are essential design collaboration tools, that allow these industry professionals to deliver projects more successfully. The building industry has favored a move to BIM processes and design collaboration tools over the last decade because of the accuracy and efficiencies they provide in the design phase. BIM has also been proven to increase productivity and save money when working with restrictive budgets. In fact, 75% of design professionals report a positive ROI in their BIM investment. These surveyed professionals also stated that the higher their BIM adoption, the higher their return. Research shows that BIM saves more money as the team gets more collaborative. 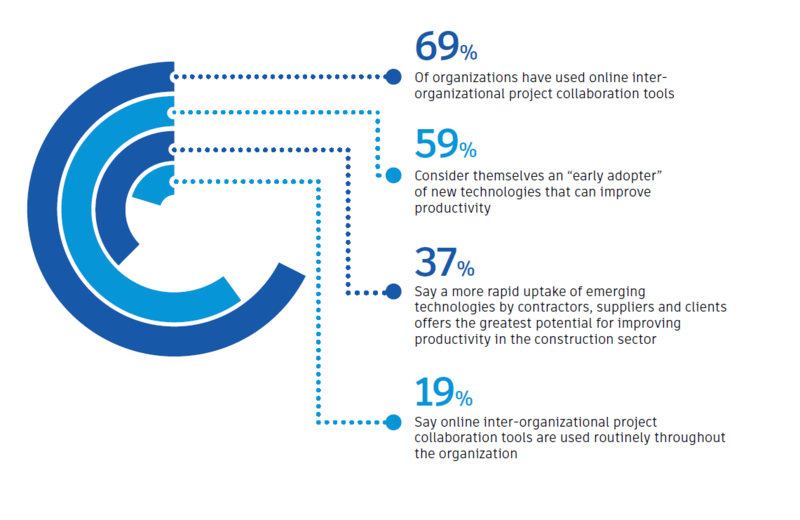 So how do you ensure that you’re maximizing your investment in BIM design collaboration? There are a myriad of benefits to a cloud-connected BIM project team, but we’ve broken them down into 9 specific benefits for you in the eBook, “Maximize Your Project Margins with Design Collaboration”. During the construction phase of building design projects, the cost of rework ranges from 5% to 15% of the total project cost. This is why reducing errors in the building design environment is a goal of all AEC firms. The use of BIM itself reduces project error, and improved collaborative processes help amplify this benefit. 57% of architects surveyed rated reduced document errors and omissions as a top beneﬁt of BIM. However, in the new reality of distributed teams and joint-venture projects, it can be harder for project teams to fully realize every beneﬁt of BIM. With multiple team members spread across different locations, a cloud-based design collaboration solution can be the differentiator that helps teams reap the beneﬁts of BIM by facilitating the necessary real-time communication and data sharing. 33% percent of AEC professionals have found that accessing the latest set of documents and having the most current information is a challenge in completing a project, and 32% worry that someone will use the wrong revision. With a cloud solution that has a real-time project communication log and version history tracking, that exact revision is ﬂagged to all parties, as well as being updated in the master model that everyone is working with. Contractors can take advantage of access to the model to run clash detections earlier in the process. Detecting a clash or error costs thirteen times more in the construction phase than identifying a potential issue in the design phase of a BIM project. Solving a clash in BIM is much cheaper than on-site, costing approximately $90 versus $1100. Project delays and cost overruns are often due to human error, caused by a lack of communication and poor project, data, and documentation management. Human error is greatly reduced by using one collaborative building design solution, where analysis can be run frequently and accurately. 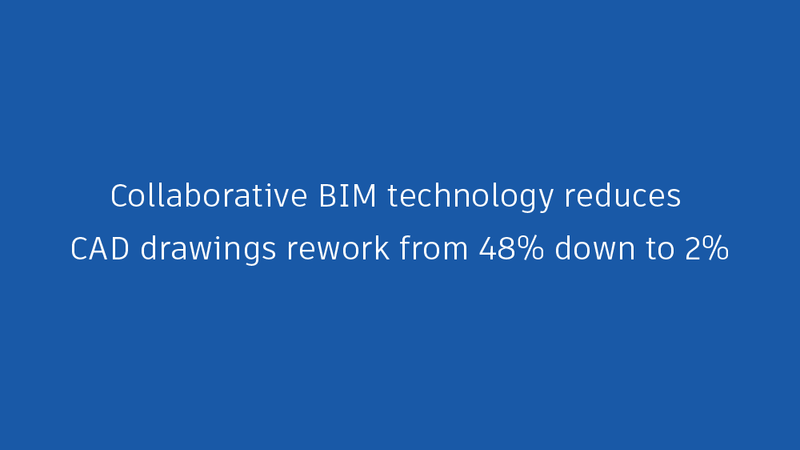 Collaborative BIM technology reduces CAD drawings rework from 48% down to 2%. Over 60% of major capital programs fail to meet cost and schedule targets. Inefﬁciencies built into traditional project delivery processes can incur signiﬁcant costs and time requirements. A more efﬁcient BIM workﬂow can streamline project timelines and reduce overall costs, beneﬁting all project participants. BIM, coupled with a cloud-enabled collaboration solution, can save a project team time across the whole building design process. Designers can quickly iterate design elements to, for example, evaluate and optimize building performance, reply to client requests, or conduct analyses and simulations in the early design phase, editing out potential issues much earlier in the process. Cloud-based collaboration solutions that enable all team members to participate in real-time—whether they are working directly in BIM or viewing and approving the outcome of design changes—can dramatically speed workﬂows. With routine design updates communicated to the team continuously via the cloud, in-person meetings can be dedicated to important forward-looking discussions rather than to everyday logistics. You keep the beneﬁts of collaboration, but move the day-to-day into the cloud. In this case, the cloud just becomes an evolution of more traditional ways of working. The level of investment in BIM design collaboration is directly correlated to successfully delivering a project. Using multiple software tools during during a construction or design project can cause duplication of data – nearly a third of AEC professionals reported this! Inability to co-author, because team members who are not on site struggle to access the model. Inability to share files with with project owners or stakeholders who don’t work directly in BIM, but may need to simply access the latest plans.This setup can delay critical feedback. With a cloud design collaboration solution, however, these extended team members can login and view the 3D model in a more accessible viewer, improving the speed and accuracy of their feedback. Cloud design collaboration solutions can also be deployed almost instantly and scaled up or down depending on the size of the project and the associated team. Hosting the workspace in the cloud makes real-time, synchronized design possible for your next or current project. Read the rest of the ways design collaboration can maximize your ROI, and how connectivity, collaboration, and the cloud impact design professionals.